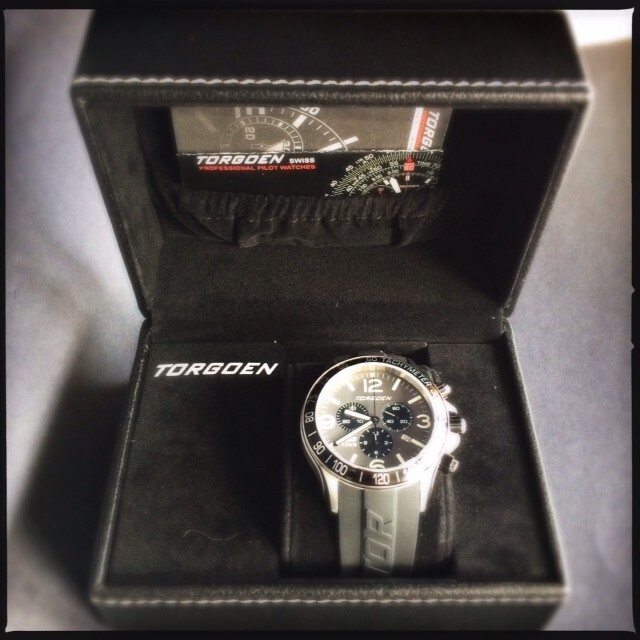 Since 1998, Torgoen watches has produced aviation themed watches for pilots and regular old Time Bums like myself who enjoy the function and style of a pilot’s watch. 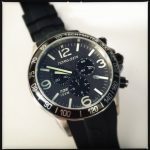 Many of their offerings are flight computers and instrument style watches, but they have added a number of chronographs as well. I have had the opportunity to examine the Swiss made T35 quartz chronograph with tachymeter bezel, and have come away impressed. The T35 was inspired by Ben Rich, a National Aviation Hall of Famer known as the “Father of Stealth” for his lead role in the development of that technology for the F-117 Nighthawk, but stealthy is not a word I would use to describe the T35. 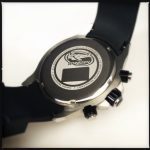 It is a large, aggressive watch, available in several metallic color schemes, including black, red, blue, and grey, with black, grey or cream color dials. A bracelet option is also available. For this review, Torgoen supplied a grey T35202 on a black polyurethane strap. The dial will be familiar to those who know Torgoen’s T10, T16, and T30 series, as it shares the same layout of oversize Arabic 12/3/6/9 numerals with sticks for the remaining markers. It is a design that would look right at home on an aircraft instrument panel. The large markers and high contrast make for easy legibility. Swiss luminous material lends the same functionality to low light situations. In a departure for most other watches in the collection, the T35 does not have sword hands. Batons are used instead. Three black subdials are set into the dark grey primary dial, and the hands and markers (with exception of the central second hand) are white. A steel flange rings the dial. 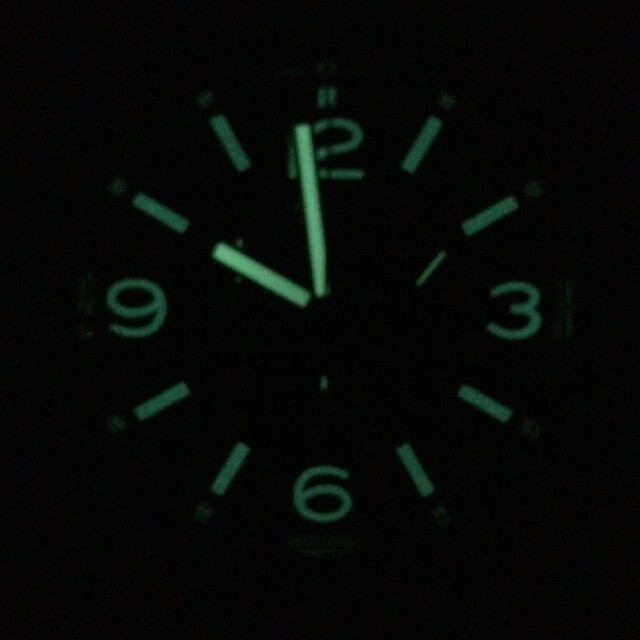 Unlike many chronographs, the subdials on the T35 do not intrude on the numerals. The Torgoen brand is written at the top of the dial, model number in the lower left, white-on-black date window in the lower right at 4 o’clock. Every bit of the expansive dial is occupied, yet somehow, it not crowded. A 37mm flat mineral crystal tops it off. The tachymeter bezel is similarly bold. It is angled with a glossy black insert, and the index is printed in a large, silver type. When I first saw the watch in its product shots, I thought the typeface might be too large, but I am pleased to report that my fears were unfounded. In person, it appears properly balanced. The stainless steel case is 44mm across and 13.7mm thick. The long, tapered lugs are angled downwards and are united by a sweeping arc that fits your wrist, minimizing its bulk. Unlike some large quartz watches, it feels reassuringly solid, not hollow or tinny, a perception I credit to the quality of the case. It wears a brushed finish on the top and sides that is broken by a polished beveled edge between the two surfaces. This section follows a contour line along the sides of the case, broad at the lugs and tapering to a thin line at the bezel and lugs. I always appreciate a case with more than one finish, and this one uses the combination to a particularly nice effect, adding character and making the watch appear slimmer. The crown and pushers are polished with plated collars that coordinate with the bezel. On this watch they are black. Neither the crown nor the collars screw down, but the watch is nonetheless rated for 100m, as are most of the watches in the Torgoen stable. 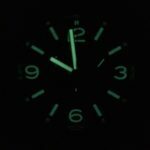 This makes the watch useful for anything short of scuba diving, and certainly more than sufficient for anything it might encounter on the typical Time Bum weekend. The case back is polished and like other Torgoens, is etched with the image of an airplane. Nestled in this case is a Ronda Swiss quartz chronograph movement with 30 minute, 12 hour, and small second subdials. The central sweep hand performs the stopwatch timing function. The watch has both add and split functions for timing two events. The large pushers are easy to operate and depress with a satisfying mechanical feel. For precision timing, I would have liked a 1/10 second counter, but given the limits of my own reaction time, I suspect I am not giving up too much. The polyurethane strap is the same 24mm unit with curved ends used on many other Torgoen models. While it is comfortable and durable, I could easily live without the massive Torgoen branding across its length. I know Panerai has done the same thing but frankly, I am not crazy about it there either. I think the watch is just begging for a black leather strap with white stitching. Torgoen offers one in Italian leather for $65 on their site, and of course, there are dozens of aftermarket options around. 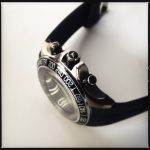 The strap tapers to a 20mm buckle with the brand name engraved and filled in black. The T35 starts at $485 for the poly-strapped model shown here and tops out at $540 for a stainless steel bracelet model. It is a lot of watch and there is a lot to like here. It is certainly large but it wears comfortably on my smallish wrist and the tapered lugs and polished character line minimize its bulk. It is strictly a casual piece, but a sober one. The different shades of black, silver, and grey play off each other beautifully, creating visual interest and satisfying dimension. If you are looking for a solid, sober, sports watch, the T35 is well worth a look.